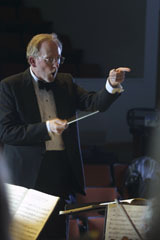 John Corrie, lecturer in music at Bates College, directs the college choir in two December programs open to the public at no cost. The choir sings Johann Sebastian Bach’s “Magnificat” and Morten Lauridsen’s “Lux Aeterna” at 8 p.m. Friday, Dec. 2, and Saturday, Dec. 3, in the Olin Arts Center Concert Hall, 75 Russell St. For more information, please call 207-786-6135. Bates holds its annual “Carols by Candlelight” program, a communal singing of music for the holiday season, at 5 p.m. Sunday, Dec. 11, in the Bates College Chapel, College Street. In addition to leading the choir, Corrie will perform on the chapel’s 1982 Wolff organ. For more information, please call 207-786-8272. The “Magnificat” is Mary’s Biblical song of praise to God upon her recognition as the mother of the Lord. Bach wrote a musical setting for the text for his first Christmas in Leipzig, in 1723, and at the end of the decade revised it to produce the version usually heard today. It is one of his most popular choral works. Gathering in a candlelit chapel, students and other members of the Bates community will offer music and holiday-themed readings for Carols by Candlelight. The program will include well-known holiday songs for all to sing. A Lewiston resident, Corrie teaches harpsichord, organ, voice and musicianship at Bates, in addition to directing the choir. He performs throughout Maine and New England as a singer and on harpsichord and organ. Corrie holds degrees from Oberlin Conservatory, Northwestern University and Yale University. In 1972-73, he attended the renowned Hochschule fuer Musik in Vienna, Austria, as a Fulbright-Hays scholar.